One of my goals as a Natural Hoof Care Practitioner is to educate my clients regarding normal hoof function/movement as well as provide insight into the status of the hooves of their own horse(s). 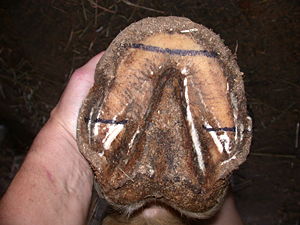 During a scheduled Assessment (which can be a separate visit or as part of an Initial Set-Up Trim) I will determine if the horse does or does not have evidence of hoof distortion and if so, to what degree. 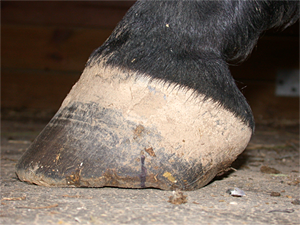 In general, hoof distortion can be defined as anomalies in the hoof that interfere with the normal functions of the foot. For instance, if your horse continually lands toe first, forges, often stumbles or has significant cracks that never seem to grow out, your horse may not be properly balanced. Horses with unbalanced hooves very often develop issues including but not limited to Navicular Syndrome, ring bone, side bone, heel pain, Suspensory ligament strain, and more. 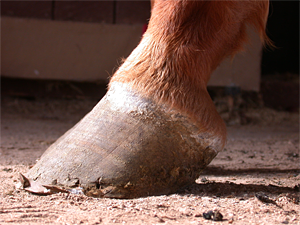 Proper trimming and shoeing which take into account things like basic hoof shape & symmetry, well connected hoof walls and balance around the coffin joint to name a few key points, can help your horse correct hoof distortions and keep him or her moving - and moving correctly. < This hoof is quite distorted. The line closest to the toe is where breakover should be. Breakover is determined based on the position of the center of articulation of the distal interphalangeal (DIP) joint, indicated by the line closest to the heels.